Are you ready to take control of your life in as little time as one week? 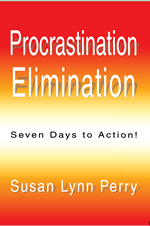 In Procrastination Elimination: Seven Days to Action!, author Susan Lynn Perry will help you define your goals and overcome procrastination so you can finally achieve them. Through real-life examples and simple hands-on exercises, Ms. Perry will show you how to stop putting off until tomorrow what you can do today. Be ready to learn, ready to change, ready to be in control. Finally, be ready to just do it, because if you can dream it ... you can do it!